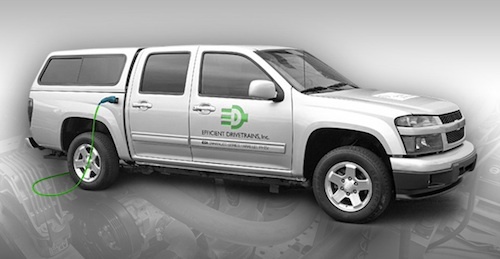 UQM and Efficient Drivetrains, Inc. (EDI) announced on Tuesday development of a new electric vehicle drive train system that is less complex, more efficient, less costly, and lighter than competing. The design, the world's first Parallel-Series-Electric powertrain system, allows for dynamic switching between series-hybrid, parallel-hybrid and pure EV modes while driving. In a series-hybrid the gas engine solely drives a generator to charge the battery pack. The Chevy Volt is a series-hybrid in most of its operation. In a parallel-hybrid, both the gas engine and electric motor drives the wheels at the same time, and additionally the gas engine runs a generator to charge the battery pack. The Toyota Prius is an example of a parallel-hybrid vehicle. In pure EV mode the gas engine is turned off completely. The new drive train, developed by EDI, uses components from GM, A123, and UQM. It was integrated into a light-duty GM pickup truck for demonstration purposes. The company claims the drive train is scalable to light (normal cars and trucks), medium (mid-size trucks), and heavy-duty applications (big trucks), utilizes no power split gears and features special clutching systems. The drive train is designed with an "inline form factor" which is targeted for front engine rear wheel drive vehicles. They expect it to be easy for OEM's to convert an existing vehicle design to use the drive train, with no significant design changes. "For manufacturers and consumers alike, this is the most adaptable automatic vehicle drivetrain in the world, and the vehicle has performed extremely well in initial testing," said Joerg Ferchau, Co-founder and CEO of EDI. "It's scalable, less complex, and lighter than the competition. When conditions warrant, it can operate as either a pure EV for trips around the neighborhood, or as a Series Hybrid, optimum for stop-and-go city traffic conditions, or as an efficient Parallel Hybrid that is ideal for the highway. It also features an EV+ Mode for hill climbing and added acceleration." Using the drive train, EDI has developed a "second generation plug-in hybrid-electric vehicle" concept. The design has a larger battery pack and higher efficiency than predecessor designs. The motor system has fewer parts, is smaller, and can integrate with more efficient gasoline and bio-fuel engines, including engines with turbo-charging. The latter option is claimed to make it the highest efficiency drive train in the world at a given power. "This is the simplest, most elegant, most efficient design possible to capture the three basic modes of vehicle operation," said Ken Baker, CEO of TechBroker LLC, EDI Advisory Board member, and GM EV-1 creator. "This goes a long way to proving EDI and their technology as a viable option for industry, as well as commercial partners." EDI is expecting to announce soon a commercial contract to implement the system into a full size, heavy-duty bus project in China. EDI is a Silicon Valley based developer of drivetrain products and technologies that have direct application in PHEVs, HEVs, and BEVs worldwide. The company was co-founded by Professor Andy Frank, of UC Davis, who has been researching electric and hybrid vehicle technology for decades. UQM develops power-dense, high-efficiency electric motors, generators and power electronic controllers for the automotive, commercial truck, bus and military markets. A few additional comments on the EDI drivetrain: 1. The engine of the current PHEV truck is downsized by a factor of 2 from the typical light duty truck for now, giving the truck greatly improve highway fuel economy in spite of the increased weight due to the PHEV batteries. 2. Heavy duty truck PHEV engines may not be downsized as much. 3.The two motor PHEV powertrain may be easily adapted to front wheel drive Light Duty Vehicle systems with all the current benefits. 4. Acceleration and passing Performance can be much better than the conventional vehicle even with a much downsized engine as in the current truck. Prof Andy Frank CTO Efficient Drivetrains Inc.